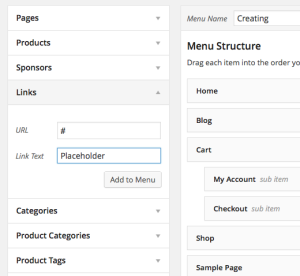 When setting up WordPress navigation, I’m often asked how do you create a “placeholder” in the navigation menu. Typically the user wants to have a drop-down menu in the navigation, but there is no need to have the top level item actually be a page on the site. They just want it there so that the drop-down can be placed below it. 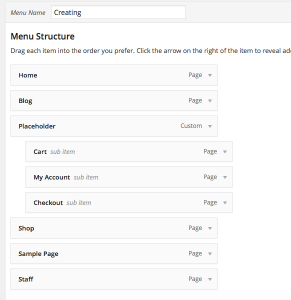 In your WordPress admin, click on Appearance and then menus to bring up the navigation builder. Then in the spot for “Link Text” enter the text you’d like to have appear in your navigation menu. Click the “Add To Menu” button. Now WordPress will add the custom link to your navigation menu at the bottom. You can drag it higher in the order to place it. To make items a sub-menu below it, drag them slightly to the right and they indent. That indicates they are now sub-menu items to what’s above them. Once you’re finished, save your menu. That should give you a placeholder item in your WordPress navigation menu. Should a user click on the placeholder item, they’ll stay on the same page (without a page reload) and will notice the items below that they can browse to. If you’ve discovered any other useful tricks for navigation menu items, share them with us in the comments below. Thanks for the tip. Always wondered how to do that! Thank you so much for this detailed instruction Bill. I have always wondered how to do it and didn’t even know how to explain what I actually need. That’s so helpful!